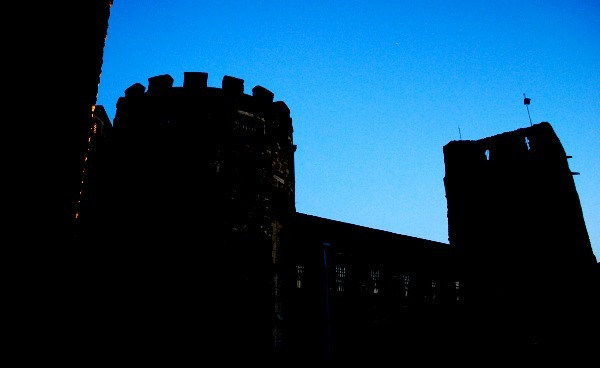 Oxford Castle & Prison is a tourist attraction which takes you inside the oldest parts of the former Oxford prison which was still in use until the 1990s. 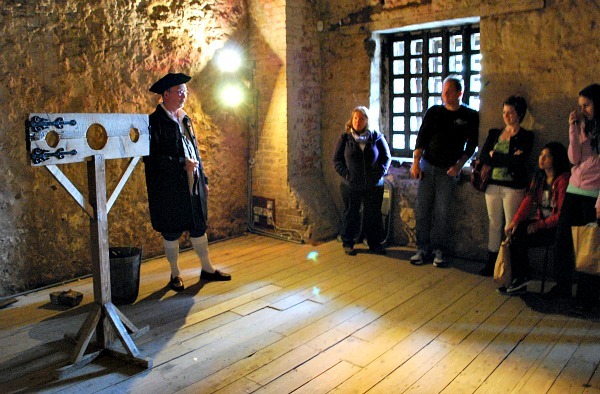 You are led around St George’s Tower by a costumed guide who plays a role from the prison’s past. Our guide was a former governor called Solomon who played his part with relish! After the trip up the tight, winding steps of the tower, you get to enter the crypt under the former chapel and then the old cells themselves. Our entire visit to Oxford Castle lasted around an hour, but in that time we felt we got a real insight into the building’s history and what life was like there as both a prison and a castle. The lighting is dim with spotlights here and there which helps to maintain the feeling that this was a dismal place to be incarcerated. As such, it’s not unusual for people to see things they can’t quite explain. One of our party says she saw a woman dressed in a white cloak at the bottom of St George’s Tower and she thought she was part of the performance tour. When she did not take part in the tour, she asked about it and staff told her there was no such woman there that day. After a bit of Googling, it seems this ghost (if that’s what it was) is the most seen in Britain! One of the highlights of the tour is the view from the top of St George’s Tower. The stairway is a tough climb, but when you get to the top, there are two levels. Firstly the level of the roof itself, where there’s plenty of the room for the whole party to walk around and look through the ‘windows’ at the view of Oxford. Secondly, a special viewing platform has been constructed with it’s own stairs and you can climb them for an unobstructed view of the city. When you visit the Oxford Castle & Prison attraction, spend a bit of time looking around the rest of the Castle complex. There’s a swanky Malmaison Hotel and several bars and restaurants inside the old buildings there. It’s a nice place for a meal out and if you ask in the hotel, they usually let you have a quick look at the main area inside where the bedrooms are former prison cells. 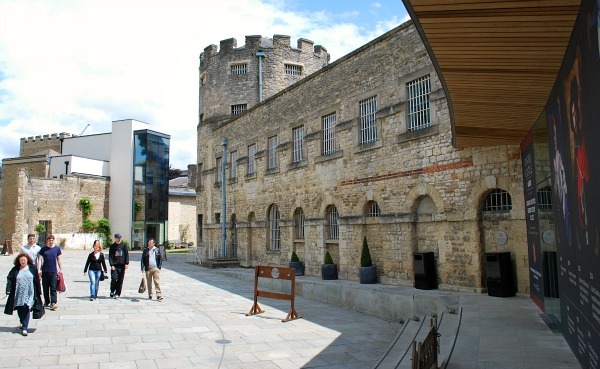 Oxford Castle & Prison is part of the complex of businesses, food outlets and a hotel which occupy the former Oxford Castle site. 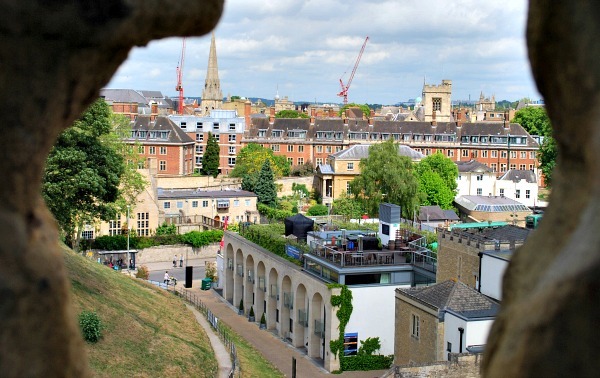 It is located near the Westgate Shopping Mall in the centre of Oxford.